The United States’ first dual crew member mission, Gemini 3, lifted off fifty years ago on Tuesday March 23, 1965, at 9:24 a.m. Eastern time from Launch Complex 19 in Cape Canaveral, FL. This was just 5 days after the Soviet Alexei Leonov’s first spacewalk. The Gemini program was intended to be a bridge between the completed Mercury and future Apollo programs. The ten Gemini missions (1965-1966) would flight test equipment and mission procedures (EVA, rendezvous, docking, and long duration) in Earth orbit for the upcoming Apollo lunar missions. 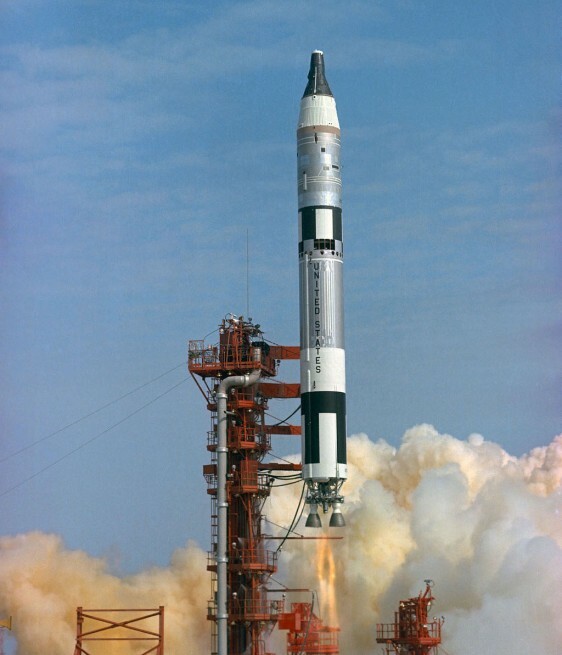 The Gemini spacecraft flew on a man rated two stage Titan II rocket which was originally designed as an intercontinental ballistic missile (ICBM). The Titan II would place the Gemini spacecraft into Earth orbit very quickly in just five minutes and 54 seconds compared to eight and a half minutes for the Space Shuttle. Gemini was the first spacecraft to have an onboard computer. 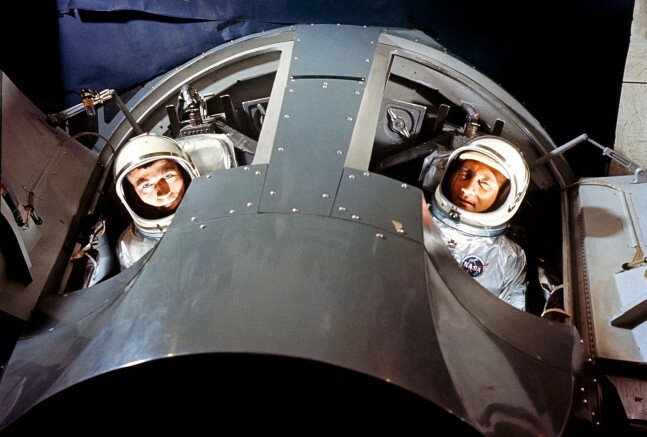 The original crew for the flight of Gemini 3 had Mercury veteran and America’s first man in space, Alan Shepard, tabbed as the Commander and rookie John Young as the pilot. However, Mercury veteran Virgil (Gus) Grissom, America’s second man in space, replaced Shepard when he was grounded with an inner ear disorder (Ménière’s disease) in late 1964. 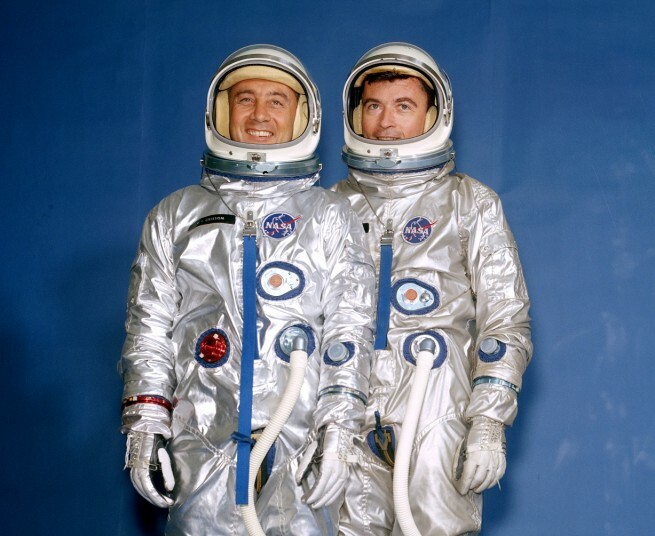 Thus Grissom would have the honor of being the first man to have flown in space twice. Gemini 3 was the only Gemini mission to be named, Grissom called it “Molly Brown” in a playful reference to his Mercury Liberty Bell 7 capsule, which sank in the Atlantic Ocean when the hatch inadvertently blew open after splashdown. Molly Brown was the title character of a popular Broadway musical of that time, The Unsinkable Molly Brown. “Wapasha” got scratched off the list of prospective names and Grissom began a new search. Hence, the Molly Brown, which was the perfect name for the successor of his sunken Liberty Bell 7. Some NASA officials insisted that he choose a more respectable name to which Grissom replied, “How about the Titanic ?” The NASA officials relented and gave in to Grissom’s request. Gemini 3 was the first US manned launch in nearly two years since the completion of Project Mercury on May 16, 1963. The primary objective of the Gemini 3 mission was to test the maneuverability of the new spacecraft. Grissom and Young fired thrusters to change the shape of their orbit, shift the orbital plane, and drop to a lower altitude; all of these maneuvers were critical firsts in the race to the Moon with the Soviets. The mission successfully ended after 3 Earth orbits and lasted 4 hours and 52 minutes. On final descent to the Atlantic Ocean, Molly Brown shifted from a planned vertical to horizontal attitude under its parachutes. However, the change was so rapid that Grissom cracked his acrylic faceplate on the control panel in front of him, Young’s faceplate was only scratched. All subsequent Gemini, Apollo, and Space Shuttle missions used polycarbonate plastic for the faceplates on the helmets. After the mission, Grissom commented: “For me, personally, the finest award I received was the opportunity for my wife and two sons to meet and shake hands with the President of the United States and Mrs. Johnson and with Vice President Humphrey.” Numerous ticker-tape parades in New York and other cities followed. “After all the Russian space spectaculars, the United States was back in the manned space flight business with probably the most sophisticated spacecraft in the world, or out of it. Our reception was the public’s way of expressing pride in a national achievement,” Grissom proudly stated. Gemini 3 was the final US manned flight to be controlled from Cape Canaveral, Florida; afterward, all mission control functions were moved to the new Manned Spacecraft Center in Houston, Texas. 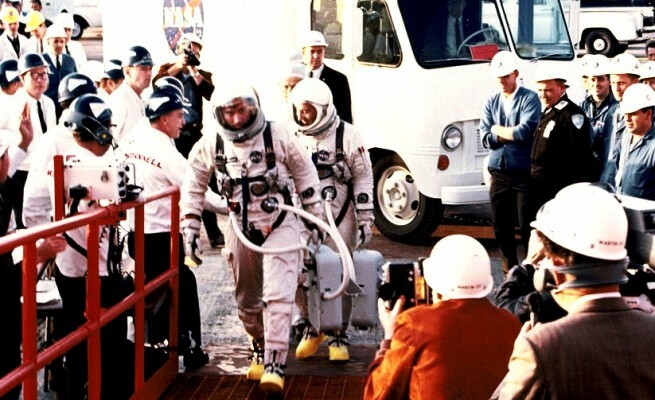 In March 1966, NASA announced that Grissom had been assigned as commander for the first Apollo Earth-orbit mission. Ed White would serve as Senior Pilot and Roger Chaffee was named Pilot. Ten months later, all would tragically perish when a fire broke out in the Apollo 1 command module during a pre-launch pad test. Today, Molly Brown is on display within the Grissom Memorial of Spring Mill State Park, two miles east of Grissom’s hometown of Mitchell, Indiana.